Happy Chinese New Year, my friends! For those who are celebrating, I hope you had a blast with your family and friends! My Chinese New Year celebration started a little late this year. My celebration commenced by going out for dinner on Friday and on Saturday, I cooked up a small feast for the two of us which included a noodle dish and baked money bags. Okay, please don’t judge! I confessed these were not the traditional Chinese money bags. 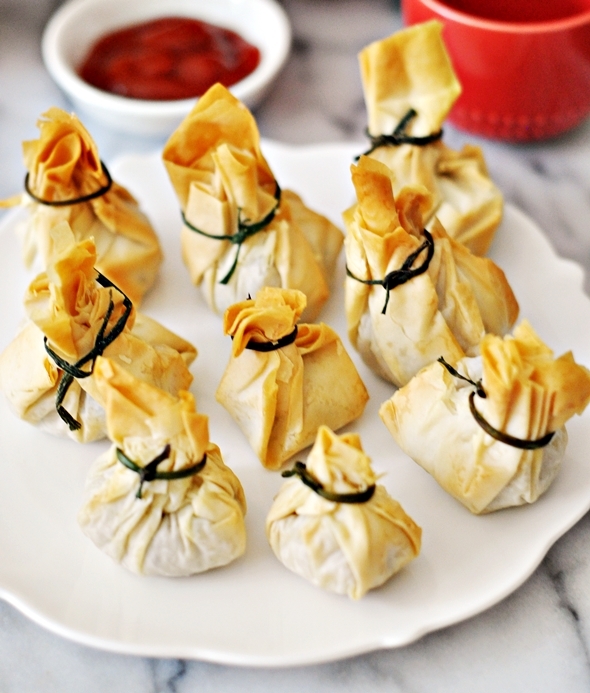 I wanted to create a money bag recipe that more people can enjoy. 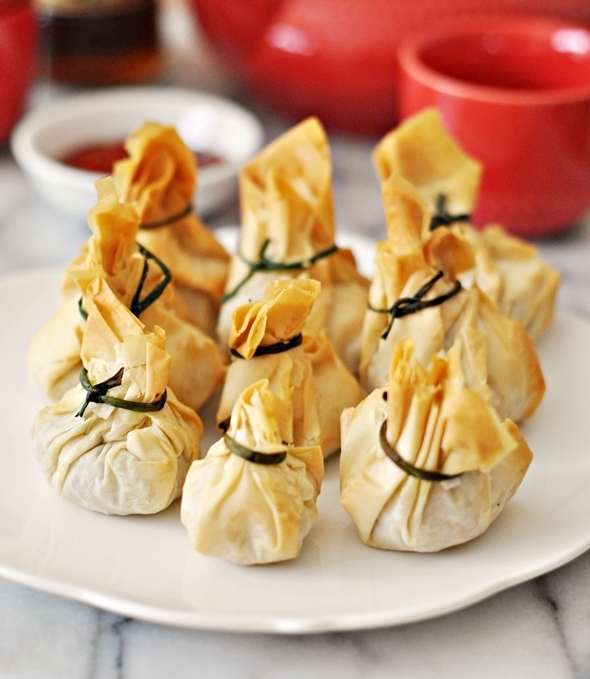 While sweet potato and quinoa are not the common ingredients found in money bags, the seasonings used in this recipe, on the other hand, are the standard seasonings for my dumpling recipe. You will notice my instructions for this recipe are on the lengthy side. Generally, this is not a difficult recipe. The challenging part for me was to work with filo pastry as it can dry out pretty quickly and became brittle and prone to breakage. HOWEVER, as these money bags were going into the oven instead of getting deep fried, I felt that filo pastry was so perfect as a wrapper as I enjoyed its light, flaky and very crunchy texture. Most importantly, because of its texture, you don’t feel the baked money bags are the lesser version of their deep fried counterpart. You will need to leave the filo pastry to room temperature before using. Read the packet instructions for guidance. The brand I used has recommended to leave the filo pastry out of the fridge for at least two hours before start using it. Otherwise the pastry will be too brittle and prone to breaking. See here for handling tips for filo pastry. Cook quinoa as per the packet instruction. Add 1/4 cup quinoa with 1/2 cup water into a small saucepan and cook until the quinoa is soften. Allow the quinoa to rest with a lid on. In the meantime, add sweet potato with 1/8 cup water in a microwavable casserole dish. Cook sweet potato in the microwave for 12 minutes (in two 6 minutes block). Test the sweet potato with a fork if they are mash able. If yes, drain the excess water before mashing. 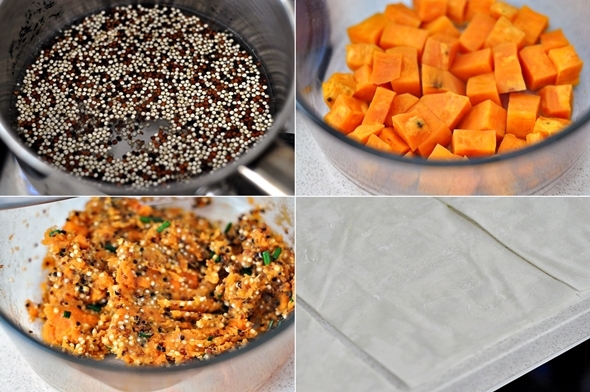 Mash the sweet potato until smooth. Add the quinoa to the mash and set aside. Finely chop about 6 stalks of chives. Add to the sweet potato mixture. 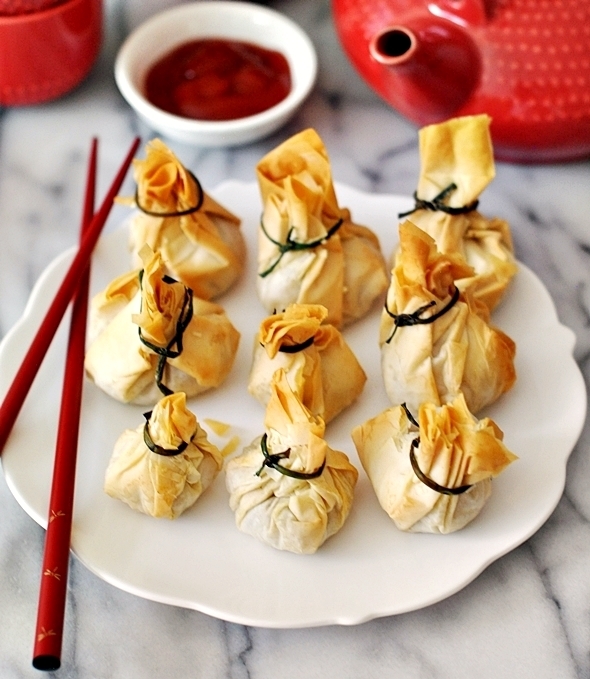 Season the filling with soy sauce, sesame oil and pepper. Set aside. Before working on the filo pastry, I would preheat the oven to 180C and line the baking tray with baking paper. Set aside. On a clean benchtop, place a sheet of filo pastry. Spray with oil (or use a pastry brush to smear olive oil on the filo pastry). Top with another sheet of filo pastry, spray with oil and place the third sheet of filo pastry. Cut the filo stacks in 3 lengthways, and then cut in halves. 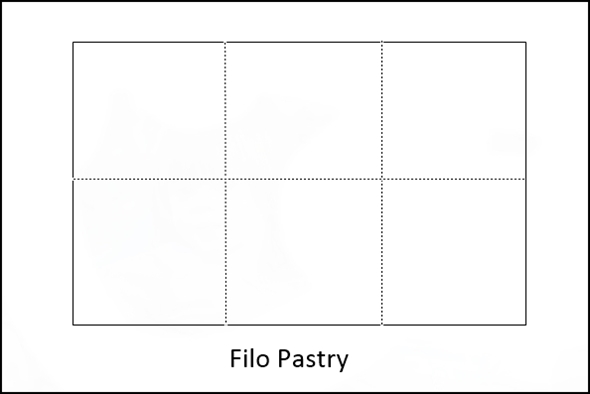 See the "filo pastry" image above for further guidance. For the amount of filling for this recipe, you will need to make 2 filo stacks, hence 6 sheets of filo pastry, 3 sheets per stack. Place 1 square filo on a flat surface and drop a teaspoon full of the filling the center of the filo square. 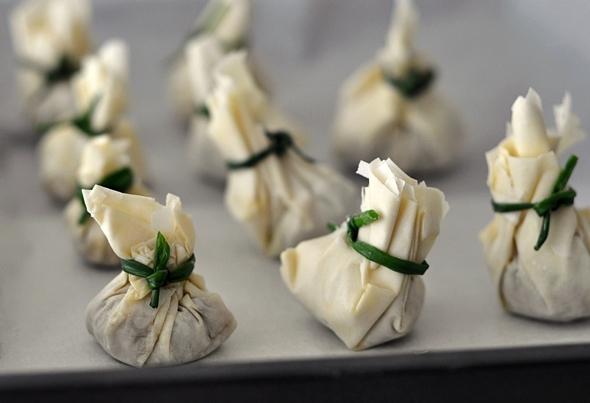 Fold all the sides up to form a pouch and pinch gently to enclose the filling. Tie with a chive to secure and placed on a prepared baking tray. Repeat with remaining filo, spray, filling and chives. Bake for 25 minutes or until light golden and crisp. Serve with sauce. You will also need a baking tray and baking paper.